The CANSORB Steel Drum Activated Carbon Adsorber is specifically designed for liquid phase adsorption to remove trace contaminates in environmental remediation applications. The liquid phase carbon adsorption filter drum is constructed of carbon steel and offers a double epoxy/phenolic lining. The liquid collection system of the adsorber is designed to promote even flow distribution and thus, efficient liquid phase adsorbent utilization. Internals are PVC. These steel drum activated carbon adsorbers have been proven by more than 20 years of field experience and are particularly useful for collecting hazardous organic and radioactive wastes. Specifications and properties are subject to change without notice. 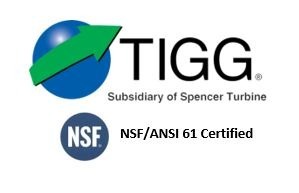 For more information about TIGG’s CANSORB Steel Drum Activated Carbon Adsorbers, call 1-724-703-3020 or click here to contact us.